The NMS FIAT 500 Abarth is a 2013 year model, and we're happy to give you a little bit of an update while we're in the middle of 2017. The car was ordered from Stateline FIAT in South Carolina in May of 2012, built to our specs in the Chrysler facility in Mexico, and shipped north by train. One fun part of that process was getting exactly what options we wanted (leather seats, rosso (or red) with the black Abarth stripe). Tracking the train shipment was fun thanks to the FCA company tracker, and at the time we saw the train rerouted north after a tropical storm was hitting the Houston and New Orleans area! 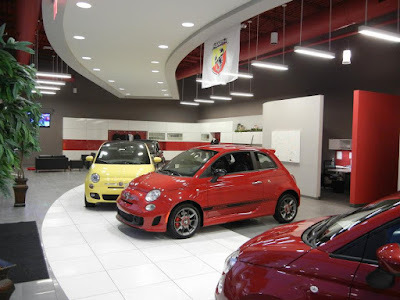 We picked up the car at Stateline FIAT in September of 2012, and it was a 2013 year model since our order had just missed the cut-off of the first year 2012 model Abarths. Fast forward to the year 2013, and NMS was formed and started competing in autocross events. At the time the FIAT was in G Stock class, and the SCCA changed the "Stock" name to "Street" in 2014. Near the end of 2014 the FIAT and its owner moved to Virginia, so ended up with two years in a row of finishing 2nd in the South Carolina Region of the SCCA GS class. 2015 and 2016 saw the Abarth continue in GS with the Tidewater Sports Car Club, and taking 1st in GS both years. During most of this time the dominate car in the GS class nation wide was the Ford Focus, so lucky for NMS there weren't a lot of Focus STs around! Then to change things up, the SCCA re-classed the FIAT 500 Abarth for 2017 into the slightly slower H Street class, so it's been a fun year with the same car in a different class so far this year. From what I can tell reading results from all across the country, the Fiesta ST and the new VW GTIs seem to be the car to have in this class, so again, luckily there aren't a lot of those around to whip up on on the Abarth! Along the way we've done more than just autocross, so with a track weekend, laps at VIR for charity, and other charity lap events at Charlotte and Darlington, plus some trips on the Blue Ridge Parkway, it's been a fun time with the FIAT so far. Today's update: the NMS FIAT has joined the ranks of cars that scientists refer to as "PAID FOR." While the myth of the "PAID FOR" car has NOT been addressed on Myth Busters, Jerry Seinfeld's Comedians in Cars Getting Coffee, or Amazon Prime's The Grand Tour, the NMS book-keepers and accountants association still maintain that it DOES exist, and offered us a glance at this odd looking scrap of paper that they called a "TITLE" as proof. Down in the lower left hand corner there was some latin mumbo jumbo voodoo hoodo lingo that spells "NO LIENS," so we're sending that off to some language experts at Harvard and MIT to analyze what this mysterious phrase actually means. For all we know, it's made up gibberish, Egyptian hieroglyphics, or some language from outer space. 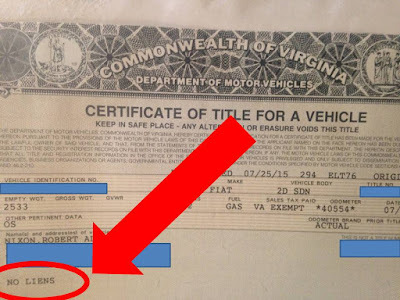 Our alternate theory is that the DMV folks can't spell so good, and meant that the car stands upright and has "No Leans." Looking ahead to the near future, NMS is proud to announce a suspension upgrade to the Abarth, thanks to winning a FREE (yes, I said FREE) set of Koni Sport yellow shocks for all four wheels. We're looking forward to receiving these and installing and then driving them on the FIAT. Our engineers state that this should help reduce the lap times, increase performance, and decrease the up on two wheels hazard. Shoot, these things might even stop global warming and cure cancer so we'll give them a shot. More to follow on this upgrade that will put both NMS cars on Konis. Thanks again to Koni Shocks! Free Koni Shocks Just Delivered! Looking even farther ahead, NMS has also announced that the FIAT and owner are going to move again soon, this time to Long Island and the New York City area. Whether or not the red car will complete the season in Virginia is unknown, since the NMS drivers seem to be dependent on having jobs to maintain their car driving habit! Asked if the NMS-North team would change their name to reflect their relocation, team spokesman Brian Nixon stated "Yeah, sure, whatever. Big Apple Racing. Salty Bob's Racers. NMS-Really Far North Racing Goobers. Pick one."